Christmas and Dickens. The two are so commonly linked in popular perception, and at this time of year not a day goes by without a different adaptation of A Christmas Carol on the television. No, Dickens did not invent the modern Christmas, but he certainly rode at the top of the wave ushering it in, and it neither begins nor ends with the Carol. Before writing his ghost of a tale in 1843, he had already depicted, for example, a wonderful Christmas at Wardle’s house in The Pickwick Papers¸ while post-1843 saw four more Christmas stories, followed by a regular Christmas number of Household Words then All the Year Round ­– special bumper issues released especially for the festive period, though not always dealing directly with Christmas in their plots. Either way, for a large portion of Dickens’s career, the winter months were a flurry of activity and increased output for the holiday season that on the whole justifies the lazy image of him as the founder of the feast. But these regular Christmas numbers came to an end in 1867 with No Thoroughfare, and shortly before this, there was a darker side emerging to the Dickensian Christmas. In Great Expectations, Pip’s first, fateful meeting with Magwitch takes place on Christmas Eve. Why set the scene at Christmas? Certainly it is a detail that few remember when they think of those scenes between Pip and the convict, though the kindness shown by Pip for this stranger in need is entirely in the spirit of Christmas. But this is followed by a very tense Christmas dinner the next day where Pip’s fears of being discovered are made worse by the interruption of the meal by armed soldiers knocking on the door; so whereas the Christmas Eve scene can be argued to be Dickens is showing charity even in the darkest situations, the spirit of Christmas triumphing through, this is undercut by the awkwardness of the Gargery’s dinner, with Pip sitting in fear and Pumblechook and Wopsle casting judgments upon him – a far cry from the warmth and humanity of the Cratchitt’s meagre meal. In his later novels, Dickens was playing against expectations of how Christmas in his works should be. A few strange faces in the streets; a few other faces, half strange and half familiar, once the faces of Cloisterham children, now the faces of men and women who come back from the outer world at long intervals to find the city wonderfully shrunken in size, as if it had no washed by any means well in the meanwhile. To such as these, it has happened in their dying hours afar off, that they have imagined their chamber-floor to be strewn with the autumnal leaves fallen from the elm-trees in the Close: so have the rustling sounds and fresh scents of their earliest impressions revived when the circle of their lives were very nearly traced, and the beginning and the end were drawing close together. So too Dickens, in the last year of his life, was retracing those familiar scenes from his earlier work. 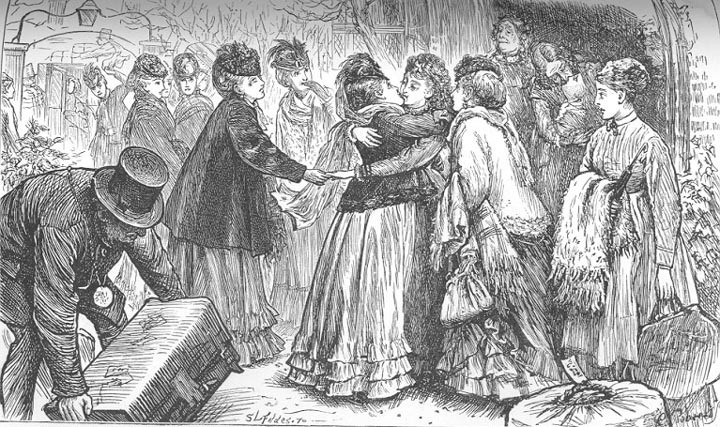 Christmas in Cloisterham is not so very unfestive after all – Edwin gives money to the poor in the shape of Princess Puffer (potentially mirroring the charitable act of Pip to Magwitch on another Christmas Eve), while he and Neville (and possibly Jasper) embrace the spirit of reconciliation and kinship by burying the hatchet. That fateful cathedral tower which may or may not represent Edwin’s final destination recalls the morbid journey of Toby Veck in The Chimes and his own intentions to fling himself from the heights. Neville’s arrest on Christmas Day again mirrors the date of Magwitch’s recapture (because Christmas is a time for sharing, caring and incarceration), while Jasper’s frantic dash through the crowds that morning is a wonderful antithesis to Scrooge’s equally frantic, but infinitely more joyful explosion onto the unsuspecting streets on Christmas Day – less ‘What day is it?’ and more ‘Have you seen my boy?’. But then if we’re talking about juxtaposition, what of the fact that this Christmas episode was published in July? So an odd little Christmas moment, not least for the central event of Edwin’s exit. But then, perhaps a murder – if it is a murder – is the most Christmassy expression of all. A nice little mystery for the festive season, or potentially a ghost story to boot – the Christmas timing of the murder may in itself be another hint at what is to come next. Let us not forget (and there are hordes of Drood scholars who will never let us forget) about that vignette at the bottom of Collin’s cover for Drood, depicting a figure holding a light spying another figure conspicuously light, almost spectral. Is this an apparition, and if so is it genuinely a ghost, someone living impersonating a ghost, or the guilty man’s imagination manifesting itself as the ghost of the deceased? The Christmas of Edwin’s disappearance may have been published in July, but it is entirely possible, given the chronology of the plot, which swiftly moves on six months before part five, that the December instalment, had it been written, might have been set at Christmas once more, and just as the Christmas before Edwin’s disappearance is marked by Durdles hearing a ghostly scream, perhaps the year after would be marked by a ghost yet again – the spirit of Edwin yet to come. 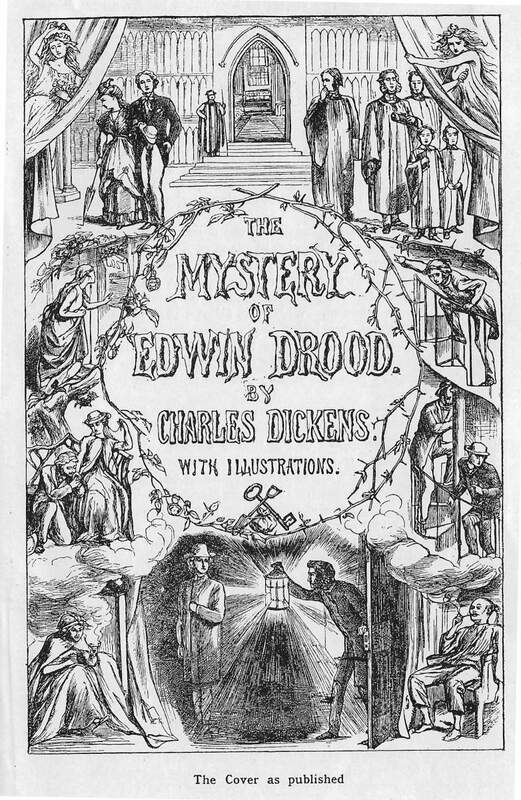 This entry was posted in Themes and influences in Drood and tagged A Christmas Carol, All the Year Round, Charles Alston Collins, Charles Dickens, christmas, Cloisterham, ghost story, Great Expectations, Household Words, John Jasper, Murder Mystery, Nineteenth Century Literature, No Thoroughfare, Pickwick Papers, Scrooge, Victorian fiction. Bookmark the permalink. Spare a thought for (apparently) the entire male population of Cloisterham who know no more than we do what has happened to Edwin Drood but have to spend all Christmas searching for him. Ha, precisely – or the lawyer Grewgious who needs to brave the train from London on Christmas day to visit Jasper in the evening. No wonder he’s so aloof with him.